The quaint seaside town of Mexico Beach offers a flavor all its own with unique shops, beachfront restaurants and waterfront recreation. Sugar-white sand beaches, clear waters and a wide variety of beach properties include beachfront homes, town homes and even canal front units with private boat docks. 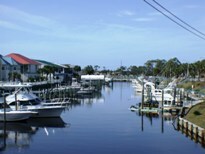 I live on the canal and can give you insight into the fishing activities in Mexico Beach. I am an avid fishermen so please ask! Mexico Beach was founded in the 1950’s and remains a friendly town where families have been making beachside memories for generations. Fishing is king here with public boat ramps and a popular fishing pier. Numerous festivals are held throughout the year with the Independence Day, Best Blast on the Beach, as one of the most anticipated. Mexico Beach is peacefully secluded just 22 miles east of Panama City where visitors can find “big-city” amenities nearby. The St. Joe Beach / Beacon Hill area is a step back in time to Old Florida with views facing west across to the Cape for spectacular sunsets. Beacon Hill is situated high above the dunes overlooking the Gulf. The area is marked with a flashing beacon light once used to keep ships off the shallow shoal. Beacon Hill Park offers tennis courts, a nature trail, a playground and more. St. Joe Beach is conveniently located halfway between Mexico Beach and Port St. Joe so restaurants, shopping and marinas are all within a five minute drive. Additionally, the shoreline of St. Joe Beach is protected by Cape San Blas which insures calm, tranquil waters. Windmark Beach is also located between Mexico Beach and Port St. Joe. Windmark Beach is a St. Joe Company development that will remind you of the beach community you enjoyed growing up. It will offer beautiful home sites and a community atmosphere. St. Joe Company is creating a first class development in Windmark Beach. Please call for additional information or visit their website. If you speak with someone there, please tell them you found out about them from the website of Bonita Thompson with 98 Real Estate Group in Mexico Beach.